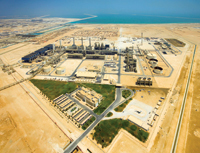 ORYX GTL, the world’s first commercial gas-to-liquids (GTL) project, continues to build and diversify the international customer base for its environmentally-friendly products. Since starting commercial production in 2007, Oryx GTL, a $1 billion joint venture between Qatar Petroleum and South Africa’s Sasol, has exported more than 20mn barrels of premium GTL products, sold initially on the spot market and subsequently on three- to six-month term contracts. The company’s ‘broad-brush’ approach to GTL sales maximises product availability to a diverse base of clients who seek high-performance, low-emission diesel and high-grade naphtha. Oryx GTL’s sales strategy is underpinned by reliable output from its state-of-the-art complex in Ras Laffan, which has a total GTL output capacity of around 34,000 barrels per day. Oryx GTL is helping drive the development of a vibrant, innovation-led community of companies in Qatar who leverage the country’s abundant natural resources to manufacture high-specification products increasingly coveted globally. As well as being a global GTL pace-setter, Qatar is a long-standing and dominant force in the global liquefied natural gas (LNG) market, helping power Asian economic growth as well meeting demand from more mature yet highly regulated European markets. A successful hydrocarbons-based industry is a key component of Qatar’s long-term national economic and social development vision. The sector is also a pillar of the economy, which is expected to grow by 19 per cent in 2011, the fastest in the world for the second consecutive year, according to the International Monetary Fund (IMF). Oryx GTL also continues to enhance its integrated management standards by becoming certified to rigorous international benchmarks for Information Security Management System and Business Continuity Management System, as outlined in ISO/IEC 27001:2005 and BS 25999:2007, respectively. Dr Mohammed bin Saleh Al Sada, Minister of Energy and Industry and chairman of the Board of Directors of Oryx GTL, recently received the company’s new certifications from Theuns Kotze, regional managing director of the British Standards Institution (BSI). Also present during the occasion were Abdulrahman M Al Suwaidi, Oryx GTL CEO; Ali Hassan Mohd Al Sidiky, director for Downstream Ventures of Qatar Petroleum; and other senior Oryx GTL officials. “I would like to congratulate Oryx GTL for being the first oil & gas company in the Middle East to achieve BS 25999:2007 certification from BSI, and I would also like to commend them for their exemplary efforts to make their information security management system fully aligned with international benchmarks,” said Dr Al Sada. Oryx GTL’s management recognises the vital importance of information security for the management of confidential data as well as to protect the integrity of its information assets.